The incidence of diabetes is increasing worldwide at an alarming rate, and diabetic retinopathy is one of the most significant complications of diabetes. Packed with outstanding retinal photos, the second edition of this one-stop clinical manual offers a comprehensive overview of the diagnosis, treatment and long–term management of patients with diabetic eye disease. • Recent changes in the treatment of diabetic maculopathy including the use of intravitreal injections of VEG F inhibitors. 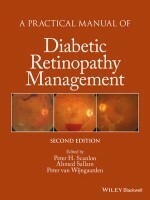 Edited and authored by world-renowned experts from leading centres of excellence, A Practical Manual of Diabetic Retinopathy Management presents evidence-based guidance relevant for a global audience of health-care professionals, including diabetologists, ophthalmologists, retinal screeners, optometrists, ophthalmic nurses, GPs, and medical students.